Variable Speed Limit Trailers - Wanco Inc. Variable speed limit signs provide dynamically changeable speed limit notification to motorists on a brightly lit, highly visible display panel. Wanco Variable Speed Limit Trailers add flexibility to this strategy, being both portable and self-powered. They are easy to deploy and require no permanent installation or wiring. Manage traffic more effectively with a variable speed limit sign you can change in response to current conditions without adding infrastructure. Wanco Variable Speed Limit Trailers display a changeable speed limit on a sign that mimics the look of an R2-1 regulatory speed limit sign. Two sign sizes are available. A large LED display panel substitutes for static speed limit numbers. The display is capable of showing white numbers on a black background and black numbers on a white background, two digits for mph and three digits for km/h. Automatic dimming helps to ensure long run times. 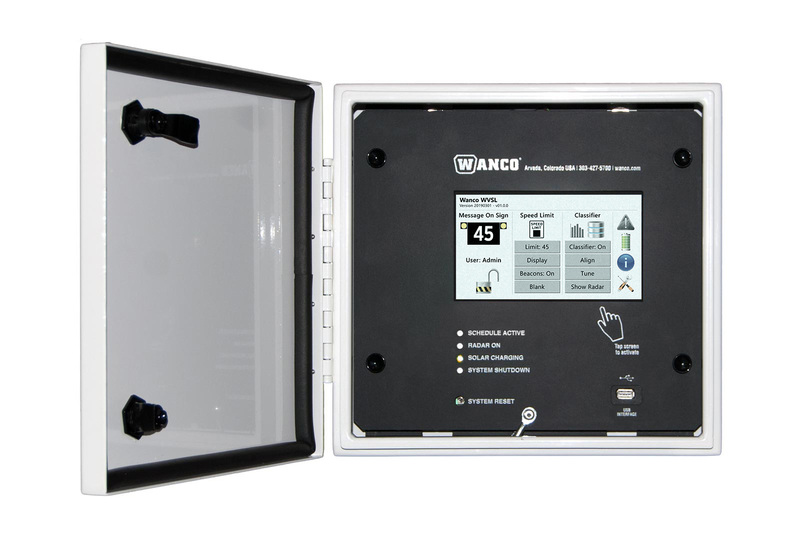 Options include the Wanco 4G GPS modem for remote communications, flashing beacons, Wanco Radar for speed detection, and the Wanco Traffic Data Classifier System. When deployed on highways and other high-speed arterials as a component of an active traffic management (ATM) system, the transportation department can change the displayed speed remotely or at the sign. Update the displayed speed in real time to accommodate changes in conditions due to weather, incidents, work zone activity and other traffic events using the Wanco Fleet Manager service or an ATM system. Speed limits can be either regulatory or advisory. Broadcast capability is built in. The display panel remains vertical at all times, raised and lowered on a vertical tower that allows the display to be rotated for orienting toward traffic without moving the trailer. When the tower is lowered for transport or storage, the display panel rests in a cradle that keeps it secure. Power is provided by batteries, which are charged by an automated solar-based charging system. A backup AC-powered charger is included. Additional solar, batteries, and regulatory signs may be added at the factory to support the application and local requirements.